World leaders gathered in New York on Wednesday to try to breathe new life into the Paris global climate accord, amid backsliding from several nations over commitments made in the historic deal. The "One Planet Summit," launched last year by French President Emmanuel Macron, aims to accelerate the implementation of the 2015 pact. "We are not here just to speak, but to be accountable," Macron told delegates at the Plaza luxury hotel in New York. Having last year warned that "we are losing the battle" against climate change, Macron called on countries to massively increase funding for climate action. Despite a stream of announcements and summits—including in Bonn in May, and Bangkok and San Francisco this month—the front line in the climate war has hardly moved, and much of the hope and goodwill brought by the Paris deal has been replaced with passivity. President Donald Trump in June 2017 announced the US would pull out, effective November 2020, and momentum from several other countries has stalled. Trump has abandoned targets to reduce greenhouse gas emissions, set by his predecessor Barack Obama, by slashing dozens of environmental regulations. Australia, one of the world's worst per capita greenhouse gas polluters, has scrapped plans to enshrine targets for reducing carbon emissions into law. And in Brazil, right-wing presidential front-runner Jair Bolsonaro has said he would pull the country from the deal if he is elected. The Paris agreement also stipulated that rich countries establish an annual $100-billion fund to help developing nations react to our heating planet. But only $10 billion has been collected so far. The United States had promised $3 billion and only gave $1 billion—under Obama. The next UN negotiating summit, COP24, will take place in December in Poland. Preparatory meetings ended in deadlock. "It looks very challenging," Patricia Espinosa, the executive secretary of UN Climate Change, told AFP. "We do not yet have certainty that we will be able to make it a success, but it's not impossible either." Fewer leaders participated in this year's One Planet Summit, organized with the World Bank and the UN. About 30 presidents, prime ministers and ministers are due to attend, including from Spain, Denmark, Norway, China, as well as from small Pacific island nations whose coastlines are getting eaten by a rising ocean. "Time is not our friend," said New Zealand Prime Minister Jacinda Ardern. We should not "have the ability to opt out of action either." Over the course of the day, participants were to announce billions of dollars of new actions to "decarbonize" the world economy, help vulnerable countries and finance the ecological transition of developing countries, particularly in Asia and in Africa. But these commitments only represent a small portion of what is needed to limit global warming to less than two degrees Celsius above pre-industrial levels, as enshrined in the 2015 Paris accord. Experts warn the global temperature is on track to surpass three degrees by 2100. A study in the journal Nature this month found that even global temperature rises of two degrees Celsius could still be enough to melt parts of the largest ice sheet on Earth, in the Antarctic, and raise sea levels by several meters (yards). Greenpeace questioned Macron's climate credentials, given that greenhouse gas emissions have recently crept up in France, mainly from the transport sector. 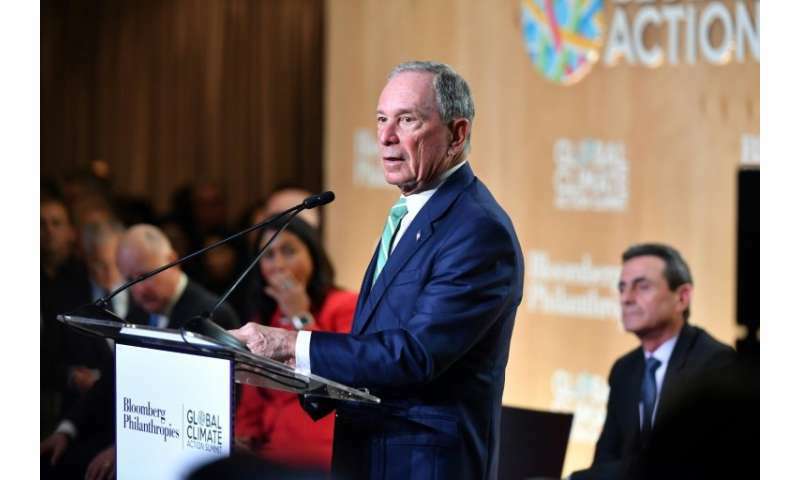 Former New York mayor Michael Bloomberg, who is using his vast fortune to spur action to address climate change told AFP that nations are making progress but ultimately, it is not governments that drive behavior. "It's capitalism, it's the economic interest of companies who want to be environmentally friendly because their employees want it, because their investors want it, because their customers want it," he said.